February 6, 2012 — This store might look like an old-fashioned pharmacy from some rustic little town, and that’s because it is. However, to me, it’s a finish line. Metaphorically. I resisted the impulse to go chest first through its windows. Of course, now that I’ve brought it up, I’m regretting that. Yesterday, I visited this ancient, humble pharmacy located in the tiny Catskill hamlet of Phoenicia, New York. It was my official last stop for the upcoming New York Grimpendium. For those of you who don’t know about my Grimpendium book projects, I’d first like to welcome you to the majority. But, if you’re interested, or unnecessarily polite, here’s information about the already published New England Grimpendium, and here is some for its future companion, The New York Grimpendium, coming this Fall. In the past ten months, I’ve traveled thousands of miles across the Sphinx-shaped state of New York, visiting every macabre and ghastly site (as the generic tagline of the books go) that I could dig up to include in the book. As Gomez says in Addams Family Values, “I have seen evil! I have seen horror! I have seen the unholy maggots which feast in the dark recesses of the human soul!” And, as he implied, it was a real blast. I haven’t done any final tallies of miles traveled or number of sites included yet, but I need to save something for the book cover summary anyway. All I know right now is that I’m tired, both my soul and tires are threadbare, and now I must spend every evening for the next month sessile and self-disciplined, sorting photos and finalizing the draft because my deadline is looming like the Grim Reaper himself. So that means hit me up on the OTIS Facebook page because I’ll be actively looking for ways to procrastinate every night. In fact, I should probably stop writing this and get to the draft right now…after one more game of Text Twist, of course, and a refill on my glass of port. 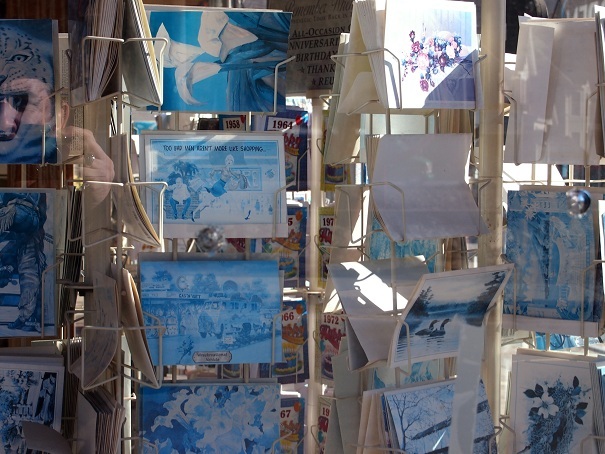 Sun-bleached blue postcards...still for sale. 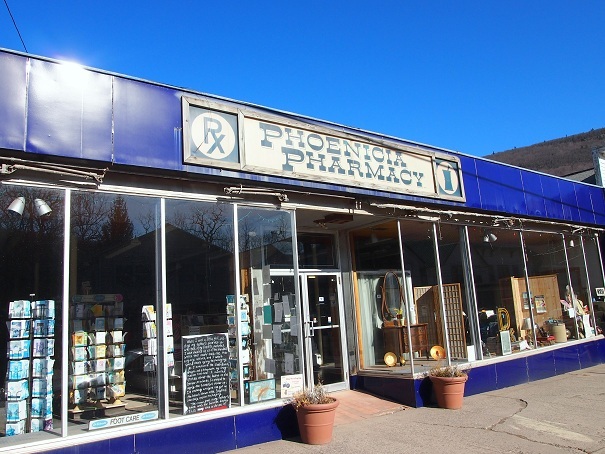 Oh, and as to the significance of the Phoenicia Pharmacy? It plays a pivotal role in Larry Fessenden’s 2001 movie Wendigo, and as a result goes in the Horror Movie Filming Locales section of the book. It’s admittedly a little bit of an anticlimax for an almost year-long schedule that included visits to the 130-year-old skull and noose of a hanged man, a toxic waste site, and an entire town of people that believe they can talk to ghosts, but you shouldn’t be judging my itinerary according to the criteria of dramatic structure anyway. But I do look forward to your judgments on the book.